The FTD Master Florist Program is an elite program only available to members with "best-in-class" quality and service. 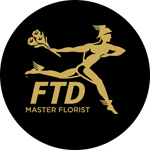 The FTD Master Florist designation allows you to differentiate your shop by promoting your Master Florist status to fellow florists and consumers. To be eligible for the Master Florist designation, your shop must demonstrate a record of fulfilling and delivering your FTD orders in a timely manner and with a level of quality consistent with the FTD Quality Star program. When you sign-up to be a part of the FTD Master Florist Program, you will receive more than $5,000 in benefits. Contact your Field Business Consultant today at 800.788.9000 for additional information.